Scientists wanted to measure how much wild Adelie penguins are eating. Weighing each penguin before and after the trip was impossible, so the scientist engineered bridges with scales. First the scientists scouted out the paths that the penguins took to the ocean and cordoned them off, leaving only precarious paths between two rocks. Between those rocks, they erected a sturdy bridge with a scale built into it. 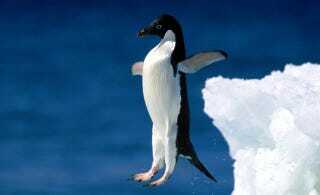 The penguins readily walked over the bridge and were weighed going into the ocean and coming out. Check out the video at The Telegraph.